At CINQ, we believe in beautifully-designed and well-developed websites. They help to positively promote your business and communicate to your visitors. We also believe that they should be a unique, custom promotion for your business. We also use the WordPress content management system as a base for all of our client sites. It is open-source, scalable and a great way to allow businesses to gain control of their content. With the ease of WordPress also comes the ease of templating/theming. For anywhere from free to $100, anyone can download and install a professional website theme on their WordPress site. These are great for some small businesses, blogs and other websites. They can make you look good fast. However, there is a certainty that your website will not only have similarities to many other sites on the Web, but look nearly identical. Does your business want a “quick fix” that looks like everyone else? Or do you want a custom, unique look? Here is a quick, 5-step process to find out if your website is using a WordPress theme. We’re going to go ahead and get the scary part out of the way first. Let’s go look at some code! Browse to your website home page using your favorite Web browser. Now, we are going to use the VIEW SOURCE command in your browser. Instructions for many popular browsers are below. In Microsoft Internet Explorer (7,8 and 9), locate and click the VIEW Menu at the top of the screen. You may also right-click on your webpage and choose VIEW SOURCE. In Apple Safari, locate and click the VIEW Menu at the top of the screen. In Google Chrome, locate the “Customize and control Chrome” icon in the top-right of the browser window (looks like a wrench). Click this icon and choose TOOLS. You may also right-click on your webpage and choose VIEW PAGE SOURCE. 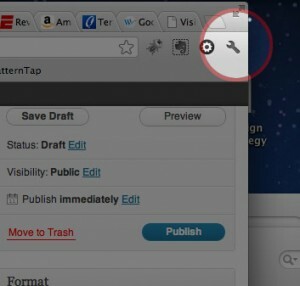 In Mozilla Firefox, locate and click the TOOLS Menu at the top of the screen. Then choose WEB DEVELOPER and VIEW PAGE SOURCE. With the WordPress framework, it’s pretty easy to locate any theme or template files. 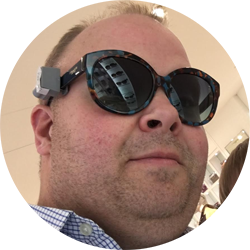 We’re going to look in the <head> of the code and find the stylesheet file. You’ll notice that the stylesheet link in this reference (our own website) is /themes/CINQ/styles.css. With this, the name of the theme being used on this website is called CINQ. Now, considering that this is not only the name of the website you are viewing, but also the company that designed it, you have a pretty good idea that this site has a custom-designed, unique theme. Now, let’s look at an example that uses a purchased theme. Similar to above, we found a stylesheet link in the code of a to-be-unnamed website. As you can see, the theme has a different name (Office), one that matches neither the website or the company in question. OK. Now that we know what theme our WordPress site is using, we’re still not sure if the theme has been altered enough to be considered unique or not. So, let’s go search for the origin of the theme. 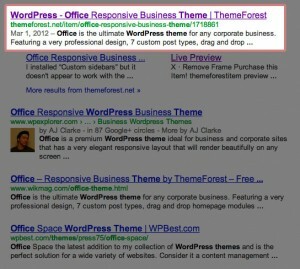 Go to Google and search for WORDPRESS THEME (name of your theme). Replace (name of your theme) with the name of the theme from your website’s code. Within the results, you should see links to one or multiple theme design shops, such as Theme Forest, Template Monster, Elegant Themes and Themify. 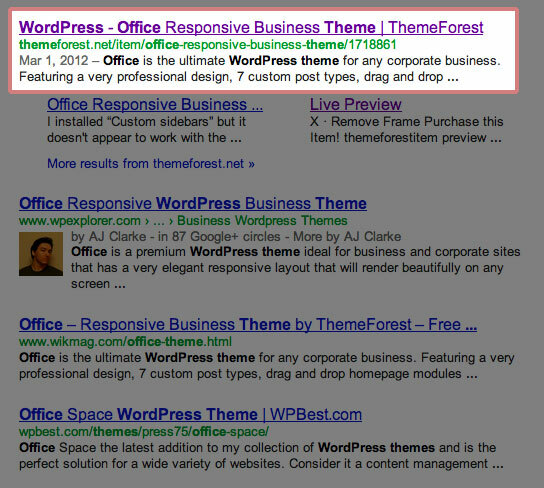 If you find a search result that discusses your specific theme name, click on it. Now that you have identified your site’s theme and located it’s origin/designer, we need to review the theme for any differences/likenesses. Look for any links for LIVE DEMO or SCREENSHOTS. These will allow you to view the working theme and identify similarities or differences in your website. Many designers that don’t have extensive programming experience choose to begin a client’s website with a theme such as this, mainly for the enhancements, plugins and complex site structure. They then overhaul the design to suit their client. This allows a designer to focus more on the “look” of the site and less on attempting to develop necessary functionality from scratch. So, your design, while using this specific theme, may look entirely different. You can then know that your website is unique to your business. However, if you review the theme demo and realize that your website is nearly identical, you then know that your website may be very similar to many other websites across the Internet, possibly even some within your own market or industry. Step 5 is completely up to you. You may be happy with your site, regardless of whether it is using a purchased theme or is completely original. The purpose of this post is to inform you, based on personal experiences from several of our clients. These clients agreed to originally-designed websites for their businesses, only to find out later that they were given themed sites that had been sold to other businesses in their industry as well. So, now you know. And knowing is half the battle.